In February 2017, the CySat team at Iowa State University was selected in NASA’s CubeSat Launch Initiative (CSLI). The team expected to launch in the Fall of 2019, but learned in August 2017 that the launch date had been accelerated by a year. This created the need for the CySat-1 Structures Team to design, analyze, build and test the 3U structure in two semesters. The team was able to design and fabricate a 3U CubeSat structure with an approximate cost of $500 that meets the design requirements for the CySat-1 mission. CySat-1 will be deployed from a NanoRacks deployer and must meet the requirements as defined in the Interface Definition Document (IDD), provided by NanoRacks. Several structural safety areas were focused on in the design. Some of those included: the natural frequency must be over 100 Hz, the satellite must be able to withstand a 5.76 grms random vibration test in a “soft-stow” configuration, and the structure must withstand a 15g static load. These structural requirements led the team to perform a combination of back of the envelope calculations, finite element analysis using the computer program ANSYS, and verification tests on the design. To ensure we met the natural frequency requirement, a modal analysis was performed in ANSYS, and the results were confirmed through hand calculations. Utilizing these results, a random vibration analysis to replicate the soft-stow requirements was performed using ANSYS. A static structural analysis was also performed in ANSYS, and the results verified with a compression loading test on an engineering model of the frame. This analysis was performed at a limit load of 20g’s. Several types and shapes of raw materials were used in the manufacturing of the structure. To allow for simplification, L-brackets were used for the rails. The team then only needed to cut them to length and cut various mounting holes. Aluminum bars and sheets were used for the rail standoffs and lateral panels, respectively. The pieces were manufactured using a CNC mill, and the final structure was fastened together using M2 bolts. 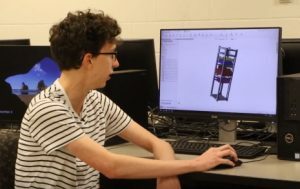 The success of the CySat-1 Structures Team shows that with minimal external assistance (for material anodization and vibration testing) students can design, analyze, and fabricate a cubesat frame that meets the mission and launch requirements. This demonstrates that a frame can be built using resources available to students and at a low cost. The true test of this frame will be when CySat-1 is launched in late Q4 of 2018 or early Q1 of 2019.